Domo is helping out the Easter Bunny this year, but it looks like he has some company! This is the same Domo I originally sculpted out of polymer clay for my little Christmas tree. His basket and eggs are also sculpted from polymer clay. The chicks were all found at a discount store. Not sure what one would do with these chicks, but I seem to have found use for them. 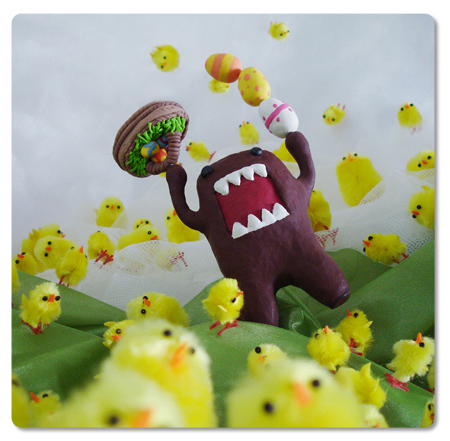 Now that all those chicks have discovered Domo, he’s going to have a lot of trouble hiding those eggs! Thanks, Cristina! Attack of the chicks!!! !